Once you have obtained or created your .stl file follow the steps below to prepare it for the printer. Makerbot has a step by step tutorial you can follow but I’ll walk you through my workflow so you can know how we have been doing it here. There is also detailed help info available on the Makerbot website if you’re interested in learning more about the software. 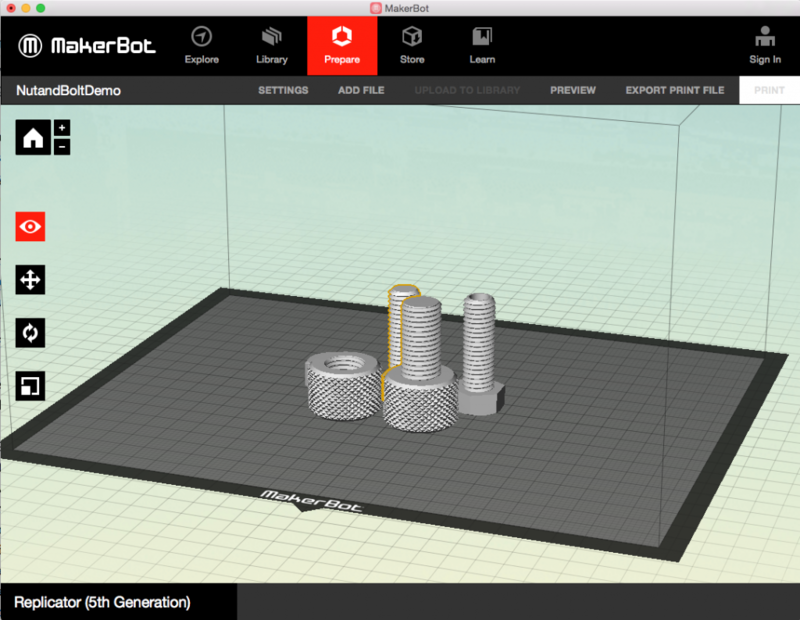 Set your Makerbot Desktop software to 5th Generation Makerbot by going to the Devices menu and choosing Replicator(5th Generation) under the Select Type of Device menu. Position and/or rotate the part so that it’s oriented the way you want to print it. Personal preference can play a role here but it behooves you to orient it so that it sits flat on the print bed. (On Platform in the Change Position menu is helpful with this.) It’s also a good idea to minimize overhanging or unsupported areas since these will either need supports or will not print properly. Once your part (or parts, you can do multiple parts in one print) is laid out properly then select the Settings button above the work area. Click here to read through a detailed description of the settings. I suggest using the following settings for most prints. For open prints with lots of airy structure using 200C Extruder Temperature will help prevent stringing. If you end up with lots of little globules of PLA on your print you may want to tweak the Retraction settings in the Custom tab. Faster and larger retraction can help with that. Supports are necessary for some prints (anything with overhangs greater than 60 degrees from vertical). Check the Supports button to add them in. Try to orient your part to minimize use of supports and also to place supports in less-visible areas as the supports are difficult to remove cleanly from your finished part. 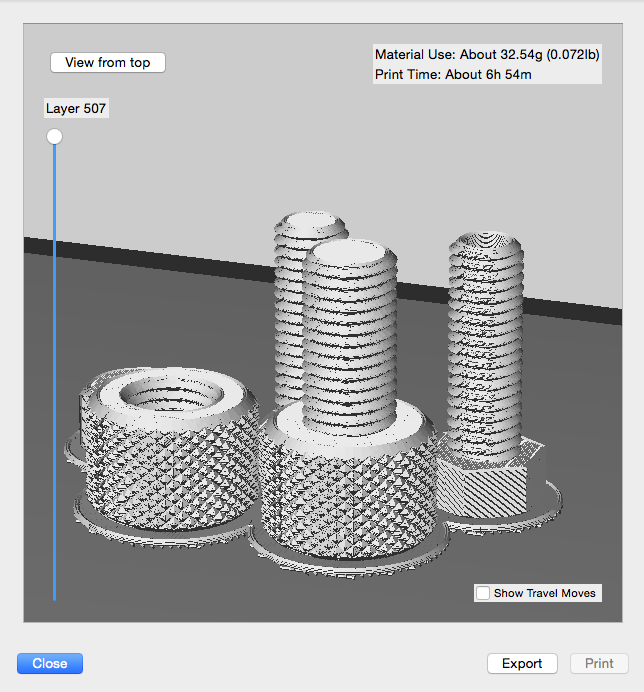 Higher resolution is sometimes better and so changing Layer Height to 0.10mm may improve the quality of your part. That being said, I have found that most parts actually look better in the end with Layer Height set to 0.20mm instead of 0.10mm. To finish the file prep just click the Export button and save the file to your USB drive (the format is .makerbot). It’s a good idea to also save the file from Makerbot desktop software (.thing format) as well so you’re able to use it again if you like. Now you’re ready to go. The .makerbot file on the USB drive is all you’ll need in order to get the print started. If you want to use one of our USB drives then you can e-mail the file to yourself and use one of the computers in the Fab Lab to save it to the USB drive. For instructions on how to actually get the print going on the printer click here (to be added later).